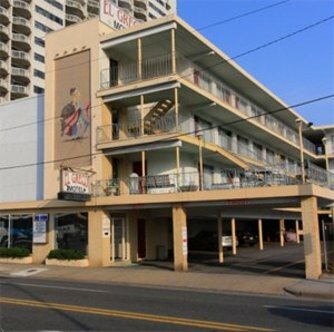 The El Greco Motel Atlantic City is a 3-story Oceanside motel with personal service at budget rates, overlooking the World Famous Boardwalk and beach in a place that is always turned on, Atlantic City. We are conveniently located close to family attractions, entertainment, and casino gaming. Our beach block location gives our guests views of the beach, famous Boardwalk and the Atlantic Ocean. Our comfortable, clean rooms include refrigerators, color cable TV, one or two beds, air conditioning and more. Reservations made thru internet may not be cancelled or changed by contacting the hotel. Cancellations made before 48 hours of arrival are subject to 20 USD penalty. Cancellations made within 48 hours of arrival are subject to a 1-night room charge penalty.